Need advice on which rimfire Rifle to get - Precision Rifle - Brian Enos's Forums... Maku mozo! My Daugther is thinking of joing a rifle team for college. The only rimfire rifle I got is a 10/22 ruger, I'm thinking of getting her bolt action rifle single shot for practice and I've been looking at Ruger American Rimfire and Savage Mark i or ii FVT but can't seem to find one for left hand. Does anybody if they made any of the those rifle left handed or should I look at different one's? Not looking to break the bank on this one since this is just a trial run for her. Thanks in advance. Let her shoot the 10/22...they can be made to be extremely accurate. Don't buy anything until she has tried it, the 10/22 fo try it might be best. There are likely rules that she should know before you buy something that might not work. agree with the 10/22 advice,but to answer your question Savage does make a 22 bolt lefty, in stock at Davidsons. thanks guys, she actuallyhave done some shooting before, she actually shoots uspsa production and trap and the 10/22 is her first gun but she never shot a bolt action rifle that's why i'm thinking of getting her one. The 10/22 can be laser beam accurate. Most bone stock 10/22's can hit a silver dollar at 100 yards. Mine will hit nickels. A pro build from someone like Kidd Custom will easily hit dimes. It used to be true that for the very best accuracy you needed a bolt gun, but those days are over. The most important things are to make sure the barrel retainer screws are properly torqued, get a good trigger (or smooth out and lighten the factory trigger yourself) and then try at least a half dozen different types of ammo to see which one that particular gun likes best. Ammo selection is a HUGE factor in 22's. I keep about two dozen types of 22 ammo on hand. I sometimes buy "can't shoot straight" guns for a song, figure out what ammo it likes and re-sell a "darn nice shooter" for a healthy profit. To save you a bunch of time (and without getting into the super expensive ammo) I have the best luck with CCI Standard and Ely Target. Those two aren't always the very best for a particular gun but they always do well. Try the CCI first, it's easier to find and cheaper. There are endless modifications and upgrades available. "Must-have" if you plan on shooting a lot are the modified bolt release, extended magazine release and BX-25 magazines. Once the 10/22 bug bites, a match bull barrel and stock upgrade are next. Then it starts getting crazy. The Savage TR shoots real good out of the box. It mimics a PRS style Tac rifle very nicely for affordable practice. No need to build, or send to Kidd, or change barrels and triggers and stuff. Just buy it, scope it, and start shooting. I do agree with the above poster about ammo. Many people don't realize that 22 ammo is right on the border of the supersonic zone, and on longer shots, the bullet is coming down through the sound barrier, and that really messes up that little flying brick. For longer shots, try sub-sonic ammo. Since the bullet never has to cross the sound barrier, it remains much more stable during the entire flight. My rifle loves SK standard plus. You just have to play around and see what your rifle likes. Now, the question is if they make this rifle in a leftie? CZ makes excellent rimfire rifles out of the box. Really nice fit and finish also. the 10/22 is her first gun but she never shot a bolt action rifle that's why i'm thinking of getting her one. Not sure there's much (if any) advantage to a bolt over the 10-22. This 10-22 accuracy you speak of, is it the result of newer technology? I have three 10-22 rifles that the newest is 23 years old and none of the three are accurate enough to write home about. Around what year of manufacture did accuracy improve? I may be a little biased in that I'm comparing the Rugers to a Winchester 52B. I know what you're saying. A friend got one back in 1988 and it was terrible, you couldn't hit the broadside of a barn from inside the barn. I don't know exactly when they got good, but newer examples routinely shoot 1 1/2 MOA and occasionally sub-MOA. 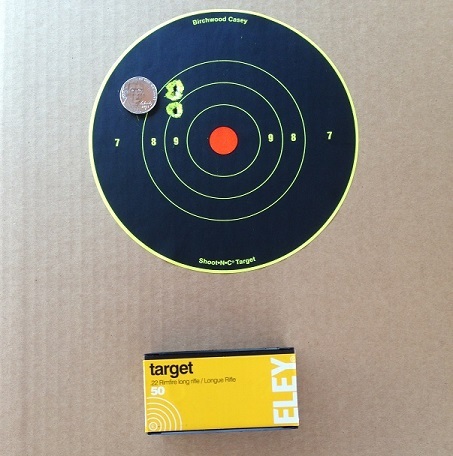 The trick to get that kind of accuracy is to experiment heavily and find the ammo each particular rifle prefers. All 22's are like that to one degree or another, semi-autos even more so. Also the aftermarket for modifying and further improving the accuracy on the 10/22 is tremendous. For less than the cost of a decent bolt gun you can make even a lackluster 10/22 shoot like a laser. All these new-fangled repeating type rifles have grown up and learned to shoot. What's the world coming to? That's three shots into a group smaller than a nickel at 100 yards with a bone stock 10/22 Synthetic Stainless model. Only mod was a scope to see what I was aiming at. a fantastic trigger. Put a good scope on that, and it was hard to beat. What he said. A big plus 1 for Kidd and ammo choice. FWIW, this is coming from a lefty, ha! Having said that, listen to MarkCO. Don't buy anything unless you have the credit card in one hand and rule book in the other. The rule book is key. If she's looking at getting into ISU or NRA 3 position, only type I know of at collegiate level make sure you read the rules. I believe the rules state you have to load every round individually. That would be a pain with a 10/22. Have you looked for a local club that does the type of shooting she is looking at getting into? All of my local clubs that shoot 3 or 4 position have rifles that juniors can use. They might not be 3 or 4 thousand dollar Anschutz's but they will work to see if it's something she likes and wants to continue doing. found some local club that do collegiate style shooting and advice me to have a her use a bolt action, doesn't have to be single shot but have to load 1 at time on a magazine. I got her a ruger american rimfire will see how this goes. I shot 3 position rifle NCAA Division 1 decades ago. A 10/22 or the Ruger will not be much help. The weight and balance will be all wrong. Anschutz 64 standard rifle might be the best compromise without breaking the bank. Or something like a Feinwerkbau Air Rifle set up for 10 meter offhand. Some of these were set up as lefties. These would come with the sights too which would make her transition easier. I have one, 10 years old, that I cut a 1/16th" foundation line in half at 75 yards with....stock. They were building my current home, and I went out one day when they weren't there, decided to try and shoot a 1/2" piece of rebar sticking up from the foundation at 75 yrads. When I put the scope on the rebar, I could see the foundation line made of nylon string/cord. So I put the cross hairs on the cord and the rebar...cut the cord, and hit the rebar, at 75 yards. I think that's pretty accurate. I've gotten absolutely insane levels of accuracy out of the Volquartsen rifles and pistols I've shot. I'm building a Volquartsen 10/22 in a Victor Co Titan stock because I've been so blown away by how well their guns shoot. I'll be using it in rimfire tactical matches. +2. For CZ rimfires. A 452 or 455 would probably be worth testing if you want a bolt action. Nicely built and accurate. Quite a few on the used market last time I checked. Rimfirecentral.com has a ton of info on these and others if you want to tune it for competition. do they make the cz 452 or 455 for left handed? Just went to the range today to run some rounds through a CZ 452 Scout. Short LOP (12") and easy to tune trigger (replaced the trigger spring and now have a 22 oz. trigger). Fit and finish is first class. Not sure if they have one for a lefty. is 17 HMR a possibilty? not for what she wanted to do, only 22 lr. I didn't know it's this hard looking for entry level rimfire rifle for lefty, most are in the $1200 plus area, so far she is getting 1/2 inch group at 15 yard and about an inch at 20 and 25 yards (standing and kneeling) using the ruger american rimfire with bulk ammo, but last week the rifle fell and somewhat chip the rear sight. Thinking of replacing it with williams peep sights.